PHOENIX (AP) UCLA’s Eddie Vanderdoes barrels toward the orange cone, plants his left foot outside it to make a cut, then slides his right foot to the inside before finishing the drill. Two of his workout partners notice the gaffe and chuckle, though Vanderdoes doesn’t seem to notice, his focus more on trying to catch his breath. ”That’s what you call athletic ability right there, fellas,” Vanderdoes says in his own defense. That part’s true, but it’s still not right. To get ready for the combine, the players go through very specific movements designed to enhance their performance in front of NFL executives and coaches at next week’s combine in Indianapolis. They work on footwork, technique, strength, speed, explosiveness – all with an eye on the different events of the combine. The eight-week program – shorter for players whose seasons ran long – includes two to three workouts a day, six days a week. The workouts are typically broken up into upper and lower body sessions, both in the weight room and on-the-field drills. That’s because everyone is training for the same thing. The horsepower comes from the work in the weight room, including squats, trap-bar dead lifts and clean pulls to build overall strength and explosiveness. 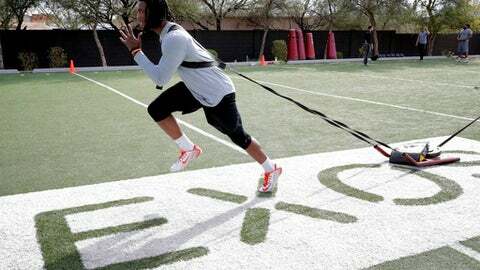 They’ll also do plyometrics and box jumps on the field to work on speed. Some players come to EXOS needing to drop weight, so the workouts and nutrition plans are set up so they lose the weight, but don’t lose strength. Some players need to gain weight, so the balance is trying to find those extra pounds and build strength without taking away from their speed.